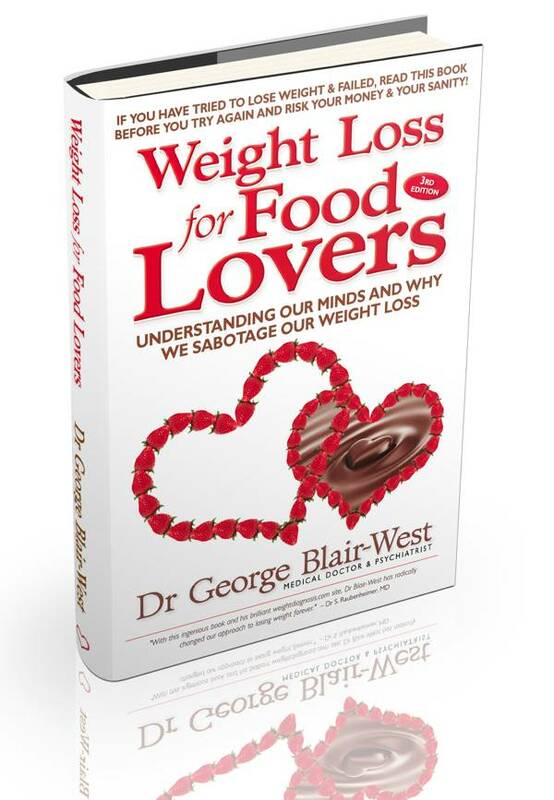 Australian Psychiatrist, Dr George Blair-West has useful ideas, that make good sense of why it’s so hard to lose weight and keep it off. He also tells us what makes it easier, especially if you enjoy and appreciate food. I particularly like his explanation of the ‘what the hell effect’ , ‘restraint theory’, and the ‘last supper effect’ . He has good logic as to why it’s so important for success, to be able to keep incorporating the foods and food sharing occasions that are important to you. This is what he calls the ‘low sacrifice diet’ and involves working out which are your food priorities and what you can do without. He is big on the concepts of mindfulness and savouring and explains why depending on will power and trying to just use exercise to lose weight, doesn’t work. George also helpfully unpacks the ‘law of diminishing returns’. This explains why the first mouthful is always the best and pleasure declines rapidly after that. However, the good news is, that if you stop after the first few mouthfuls and then enjoy it again later, the pleasure of the ‘first’ mouthful, returns – a great reason to take the rest of a beautiful meal home with you if you can, once you’ve enjoyed enough the first time.